If you have an area in your body that needs healing, visualization is your most powerful tool. The stronger your visualization technique is, the easier it is for your unconscious mind to synchronize and coordinate your internal army…your defense system. Visualization has the power to change emotions which in turn have physical effects on the body. Our bodies do indeed react to our thoughts. It is our thoughts creating our world. Image picturing is the art of picturing yourself the way you wish yourself to be, but feeling it in the moment. In order to shift energy you must be working in the power of the moment and the only way to do that is to use your inner “imagery” screen to out picture what it is you desire…feeling it in the moment. Don’t project this image into the future as if it is something you have to work towards. You must accept and act as though your goal has already been achieved. You are complete and whole now…you just need to claim it by “seeing” it on your visual creative screen. Whatever plays on this “inner creative” screen outplays in your life. So, it would work to your advantage to learn about this powerful inner tool and become adept at using it to create your life. Anyone can learn to visualize effectively. It’s best to set aside some quiet time and actually do visualization as an exercise…especially if you are actively trying to shift something in your life. Get mentally relaxed and make sure you are breathing deeply as this fills your cells with life giving breath of life. See and feel yourself complete, whole, happy and healthy…NOW not in some imagined future. Feeling is the key here because “feeling” always happens in the moment. Are you “feeling” yourself in this healed stated? Do you see your perfect body? Give way to KNOWING and allow your immune system to work its magic. Repeat this exercise as often as you can (sometimes hours at a time)…for as many weeks as it takes to convince your subconscious of the truth. Once your subconscious is on board healing happens. Now, the most important part of all…going forward in your day as though you have now been healed. If you revert back to the thoughts of illness you had before you began this exercise you’ve gone down the ladder of consciousness and entered the realm of fear again. People have reported healing things like bladder cancer in as short as two weeks using these techniques…imagining a smooth, cream colored unblemished bladder. Living as a healed person and not one who is experiencing illness is the most powerful and effective healing tool there is because you have aligned your subconscious programming with “new thought” the picture of you as a healed, healthy person and that picture is the one flowing forth now. Action happens in the moment where life takes place and this is where you must shift the energy to “heal” your body of cancer or whatever disease you may be experiencing. Embrace the fact that the disease is the distortion…one that is removed when you focus your attention (your creative juices) onto your wholeness and remove it from limitations. Our bodies and minds are operating through the same system…it works as a unit not separate. So, whatever you are painting on the inner vision screen (most of it is subconscious programming dictating our lives) is showing up in your life. Even though science cannot fully explain it, the truth is there are documented cases of people healing themselves using visualization. 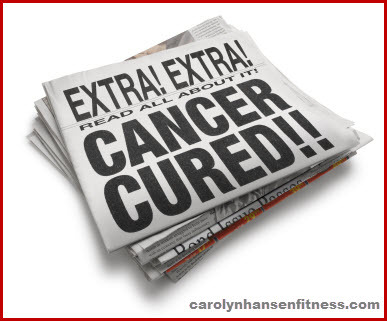 People have visualized their “cancer” away…if they can do it why not you? If you’d like to know exactly where you stand on the cancer risk scale you can take my Cancer Risk Test to find out right now if there is an invisible threat hanging over your head.